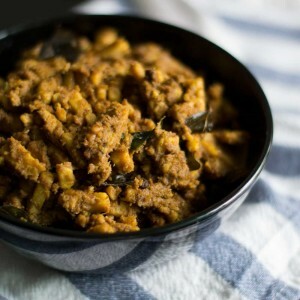 This is Renuka Aunts recipe for Senai kilangu Masala – Elephant Foot Yam Masala. I have some fond memories with her. She was 16 when she got married. Young. Too young! 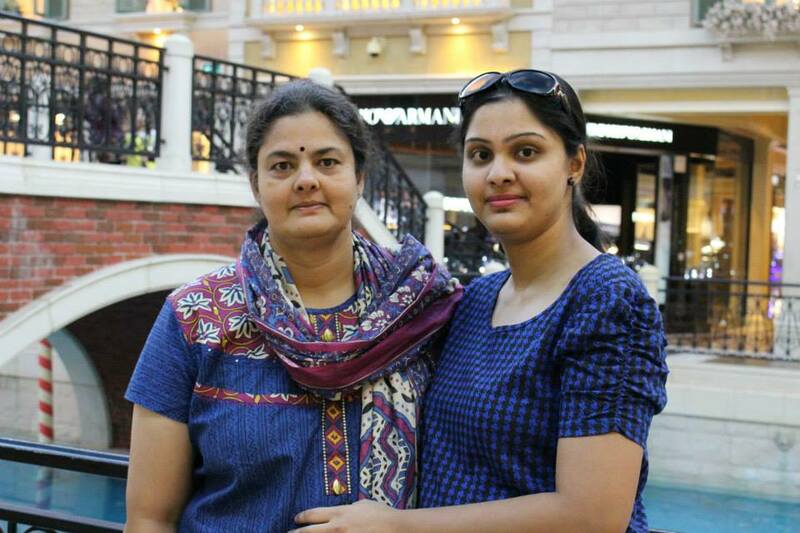 Her father ran a bus company that ran buses from Coimbatore to Mettupalayam. She was fondly called as the bus company Renu! We have had some of the most memorable moments. Me, Shruti and her, riding in her Premier Padmini 118 to Richie Rich at-least once a month for their superb sundaes. I loved their nut sundae. We would shop for the whole day around town till knees hurt. 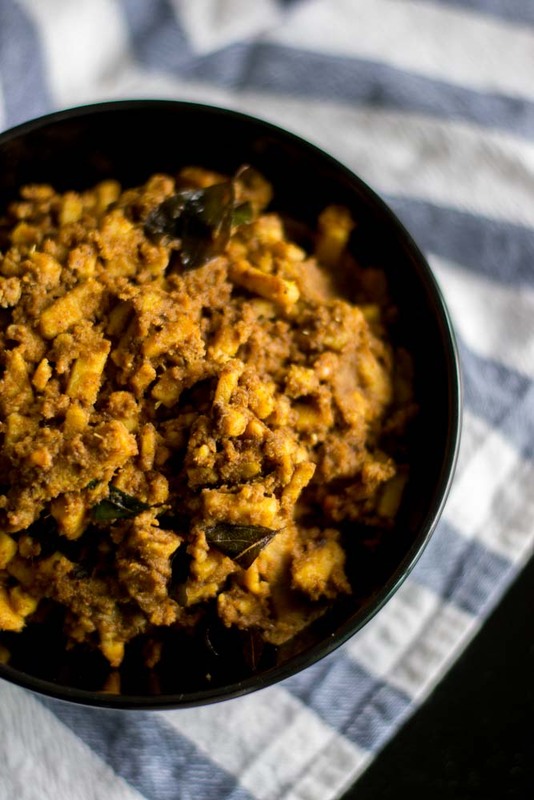 We would wind up for dinner at Annapoorna and I would gobble my ghee roast in no time. These are vivid memories that will stay forever with me. This Senai kilangu Masala is her moms recipe. 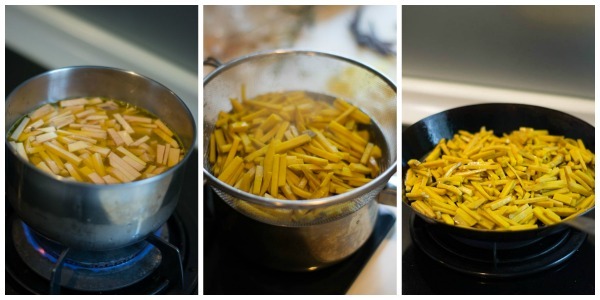 This recipe has been passed on for generations. The interesting thing about this masala is that there is no onion or tomato in this recipe. The subtle flavor of the spices and coconut makes it very delicious. 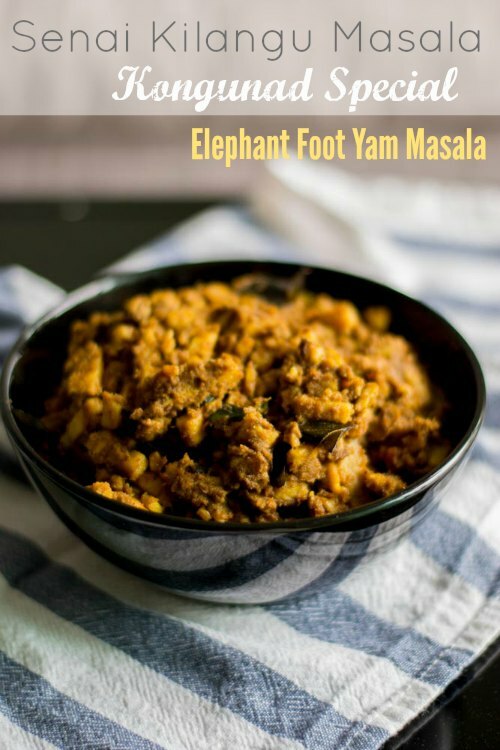 Here is Kongunad style Senai kilangu Masala – Elephant Foot Yam Masala. NOTE: Be generous with oil at every step! Clean, scrape, peel and wash the senai kilangu. Wash them several times to get rid of all the dirt and sand. 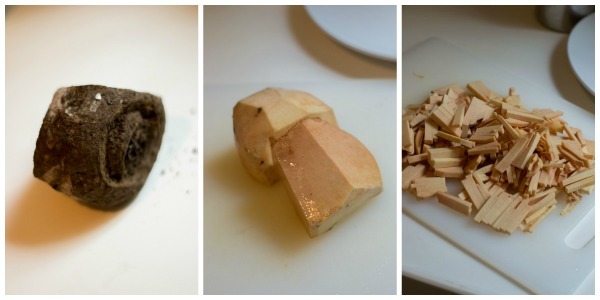 Cut the senai kilangu into little fingers like we do for finger chips. Set aside. (Apply oil in your hands to avoid itching while cutting yam). Heat a pan with a liter of water and add in the cut senai kilangu. Add in the turmeric and salt. Let it boil for 5-7 minutes until the senai kilangu is 3/4th done. Remove from heat and drain. Discard the drained water. Heat a pan with couple of tablespoon of oil and fry the senai kilangu for 10 minutes on medium flame. It should start to get brown on the edges. Remove from heat and set aside. Heat couple of tablespoon of oil in the pan until hot. 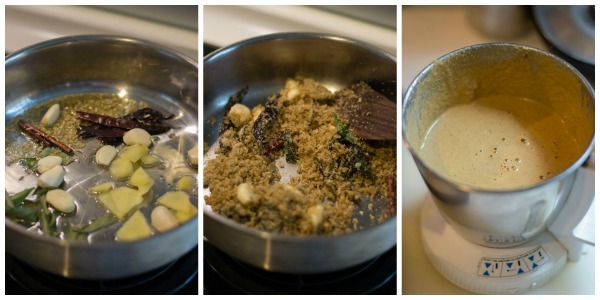 Add in the cinnamon, cloves, garlic, ginger, dried red chillies, fennel seeds (sombu) and the curry leaves. Fry for a few seconds until fragrant. Add in the fresh shredded coconut, poppy seeds (khus khus), coriander powder and the salt. Fry for a couple of minutes. Remove from heat. Let it cool a bit. Transfer the mixture to a mixie/blender and add a cup of water. Grind to a very very smooth fine paste. Set aside. Heat couple of tablespoon of oil in the pan until hot. Add in the mustard seeds, split urad dal and curry leaves. Let the mustard seeds splutter. Add in the ground masala and the fried Senai kilangu. 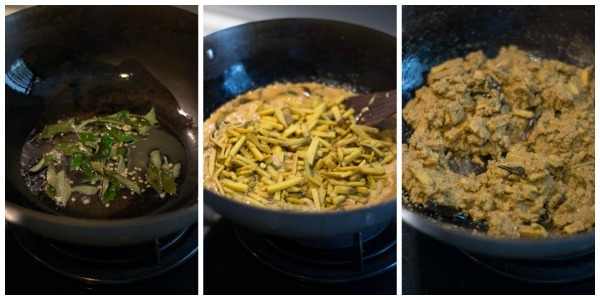 Keep the flame on medium low and fry till the masala is well absorbed by the Senai kilangu. Switch off the flame and serve Senai kilangu masala hot with rice. Recipe for kongunad style Senai Kilangu Masala / Elephant foot yam Masala flavored with subtle spices and coconut. This dish is usually served with rice. Clean, scrape, peel and wash the senai kilangu. Wash them several times to get rid of all the dirt and sand. Cut the senai kilangu into little fingers like we do for finger chips. Set aside. Heat a pan with a liter of water and add in the cut senai kilangu. Add in the turmeric and salt. Let it boil for 5-7 minutes until the senai kilangu is ¾th done. Remove from heat and drain. Discard the drained water. Heat a pan with couple of tablespoon of oil and fry the senai kilangu for 10 minutes on medium flame. It should start to get brown on the edges. Remove from heat and set aside. Heat couple of tablespoon of oil in the pan until hot. Add in the cinnamon, cloves, garlic, ginger, dried red chillies, fennel seeds (sombu) and the curry leaves. Fry for a few seconds until fragrant. Add in the fresh shredded coconut, poppy seeds (khus khus), coriander powder and the salt. Fry for a couple of minutes. Remove from heat. Let it cool a bit. Transfer the mixture to a mixie/blender and add a cup of water. Grind to a very very smooth fine paste. Set aside. Heat couple of tablespoon of oil in the pan until hot. Add in the mustard seeds, split urad dal and curry leaves. Let the mustard seeds splutter. Add in the ground masala and the fried Senai kilangu. Keep the flame on medium low and fry till the masala is well absorbed by the Senai kilangu. Tried this dish today it is absolutely delicious…Masala flavour is tempting!!! Thank you Suguna Akka.. it tasted delicious ?.. Hi Kannamma. 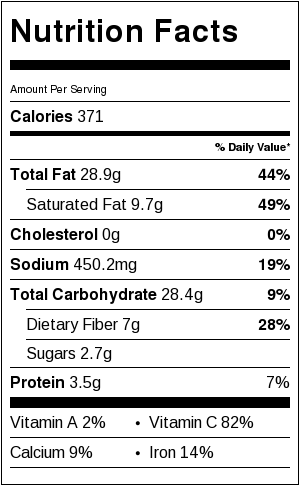 Can we use American yams or sweet potatoes? I have never tried with yam. Yummy and delicious.. Came out very well.. Me too from coimbatore.. Can you post the famous thaiyr(curd) semiya of CBE? Thanks Lavanya. I will post soon.